The Dri Eaz CMC100 Crawl Space Dehumidifier, also known as the Dri Eaz Model F391, is a medium to high capacity unit designed for use in areas where space for installation is limited. The unit is small in size, not unduly heavy and offers more options for installation than most, if not all comparable dehumidifiers. The CMC100 is built to commercial standards and should, therefore, be robust and reliable. It is designed for use in a crawlspace, a basement and a range of commercial applications where space is limited or a discreet installation in a small area is preferred. While the majority of dehumidifier reviews by consumers are favorable a number of users have been dissatisified with this product. More details are given towards the bottom of this page but, on the basis of consumer comments, we are unable to give an unreserved recommendation for the Dri Eaz CMC100 Crawl Space Dehumidifier. The Dri Eaz CMC100 Dehumidifier is a remarkably compact unit. It is designed to fit into the smallest of spaces and is particularly suitable for a crawlspace. It has a foot-print of just 10 x 24 inches and a height of only 14 inches and could even be mounted between floor joists or on a suitably sturdy shelf. The small dimensions of this dehumidifier also make it suitable for a range of commercial applications where the unit may be neatly placed in a convenient spot to dehumidify, for example, an area containing moisture sensitive electronics or a medical facility. In addition to its small size the Dri Eaz CMC100 offers unsurpassed flexibility of installation. This is due to its design which incorporates interchangeable air intake and output panels that permit multiple air-flow configurations. The standard air-flow is from front to back but this may not be possible if installation on a shelf, in a storage area, or any other location which makes a linear air-flow impossible, is preferred. To allow for this the unit may be simply configured with both inlet and outlet air ducts located on a one side of the dehumidifier, a "U" shaped configuration, or as an "L" shaped alternative with one duct on one end of the unit and a second on one side. This innovative design allows the unit to be positioned almost anywhere and still operate with complete safety and effectiveness. The unit also incorporates a 6 inch ducting collar to permit ducted applications if required. 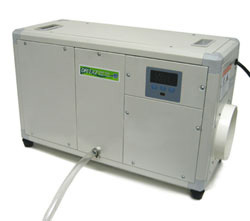 The Dri Eaz CMC100 Crawl Space Dehumidifier is a powerful unit and will remove 70 pints of water per day from the air. This figure has been tested at the Association of Home Appliance Manufacturer's (AHAM) standard of 80°F and 60% relative humidity. This standard is subscribed to by the majority of dehumidifier manufacturers whose products are sold in the US and allows meaningful comparisons to be made between different brands and models. Water extraction rates fall as temperature and/or relative humidity fall so actual extraction rates will be dependent on the prevailing conditions. The Dri Eaz CMC100 Crawl Space Dehumidifier is Energy Star™ qualified and is an energy efficient dehumidifier drawing only 5.3 amps and with an energy factor of 2.1Ltr/KwH. The unit also incorporates an adjustable humidistat with which the preferred level of relative humidity may be programmed. Once this level is achieved the humidistat monitors the relative humidity and cycles the machine on and off to maintain that level rather than running continuously. This provides a further energy saving. The Dri Eaz CMC100 Dehumidifier is configured for continuous drainage and has an internal condensate pump to assist the water flow. This enables the unit to operate with minimal intervention by the user which can be particularly important if the dehumidifier is installed in an inaccessible area. It is important to be aware that the pump does not have a high vertical-lift capacity, being limited to about 30 inches. It will still be necessary to have a drain at roughly the same level as the unit to discharge the condensate. One shortcoming of this unit is that the drain hose supplied by the manufacturer is insufficiently robust and many users have found it necessary to replace it with a stronger 1/2 inch hose, a minor but irritating inconvenience. On the positive side the unit does have an auto-restart facility so a trip down to the crawlspace will not be necessary following a power outage. The temperature range within which the Dri Eaz CMC100 Crawl Space Dehumidifier can operate is impressive. Fully effective from 100°F downwards the unit's lower limit is 33°F. Refrigerant dehumidifiers cannot operate once freezing point (32°F) is reached so this is as good as it gets. The unit is fitted with an effective auto-defrost system which allows this impressive low temperature performance. Although not designed for frequent relocation the CMC100 Dehumidifier is portable and it small dimensions and relatively light weight of 55lb make it manageable for one person to carry. Recessed handles are provided in the top of the housing and are particularly helpful when installing the unit in the confines of a crawlspace. Four adjustable, levelling foot-pads are also provided to allow for any unevenness in the surface on which the unit is sited. This unit is manufactured by Dri Eaz who have a reputation for robust, durable and reliable products. A common complaint, even from satisfied customers, is about the annoyingly flimsy drain hose mentioned above. With that exception most customers are very pleased with this unit. A minority are very displeased, a fact which we have taken account of in our evaluation of the CMC100. Click on the link to download the CMC100 Manual. The majority of dehumidifier reviews of the Dri Eaz CMC100 Crawl Space Dehumidifier written by consumers are extremely favorable. Consumers report that this unit is very effective, lowering humidity quickly (in a couple of days to a week) to the programmed level and maintaining it there without difficulty. Users find the CMC100 easy to set up and to operate. It is reported to be much more effective than even a pair of room dehumidifiers in controlling crawl space or basement humidity and more energy efficient. Most people who have commented on the noise level find it acceptably quiet when operating. The robust construction and high quality of the components impress many reviewers. The electronic controls and the large range of features included with the unit are also praised by some consumers. A minority of consumers have had less happy experiences. One complaint which surfaces several times concerns the humidistat which was found to be inaccurate. Another repeated complaint is that the integral condensate pump did not work. In one case this complaint was made by the same reviewer about his initial purchase and the replacement which was sent to him. Experiences with customer support from Dri-Eaz are mixed. Some consumers are entirely happy with the service received while others say that it is entirely inadequate. It must be stressed that the dissatisfied customers are in a small minority and that the a very much larger number are very happy with their purchase. The repeated nature of some of the complaints does, however, suggest that both the integral pump and the humidistat are potential sources of weakness in the overall package. There is little doubt that the Dri Eaz CMC100 Crawl Space Dehumidifier is an effective unit and that its compact design, relatively light weight and flexible ducting arrangements offer significant and, possibly, unique advantages for use in a crawl space. Much the greater number of dehumidifier reviews of this product are favorable, including some from professionals who have installed this unit for their customers. Although relatively few the negative reviews have to be weighed more heavily when they draw attention to multiple occurences of the same fault. Failures of the integral pump while serious are not critical but significant inaccuracies in the humidistat are critical, for two reasons. First, we rely on the dehumidifier to control humidity below the "danger level" to prevent condensation and mold and to deter dust mites. Second, the humidistat contributes to the overall energy efficiency of a dehumidifier because, if functioning correctly, it prevents the unit operating when not needed. Our conclusion is that, when working as it should, the Dri Eaz CMC100 Crawl Space Dehumidifier is an excellent product offering good value for money. The reported component failures, however, do not allow us to give anything more than a qualified recommendation for this dehumidifier.